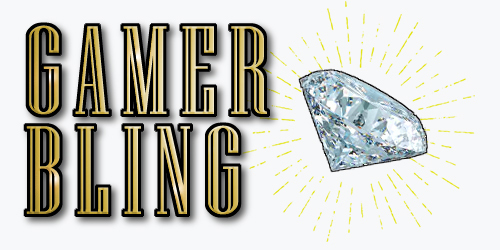 Gamer Bling is a series of posts where I share and review amazing products, services, and accessories for tabletop role-playing games that really take gaming to the next level. 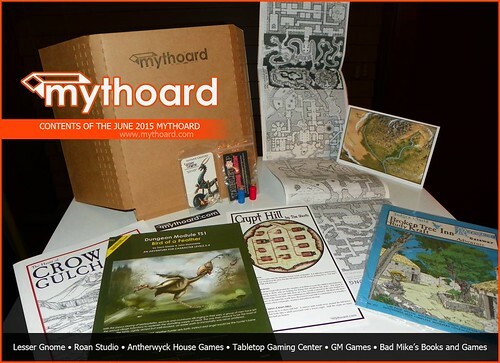 In this article, I will be covering Mythoard, the Tabletop RPG Subscription Box Service. Headed by Jarrod Shaw, Mythoard is a family-run business operating out of Saxapahaw, North Carolina. 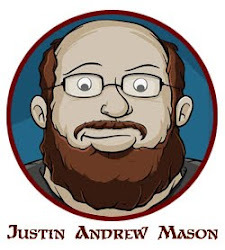 The service was the first-ever tabletop role-playing game subscription box service, and has been sending subscribers monthly boxes for $25/month (including shipping) since December of 2014. Mythoard also offers a “Mythoard Digital” subscription service for $10/month which contains a collection of PDFs and digital content relevant to that month’s physical box contents. Regular Mythoard subscribers also get these digital products each month in addition to the shipped physical box. 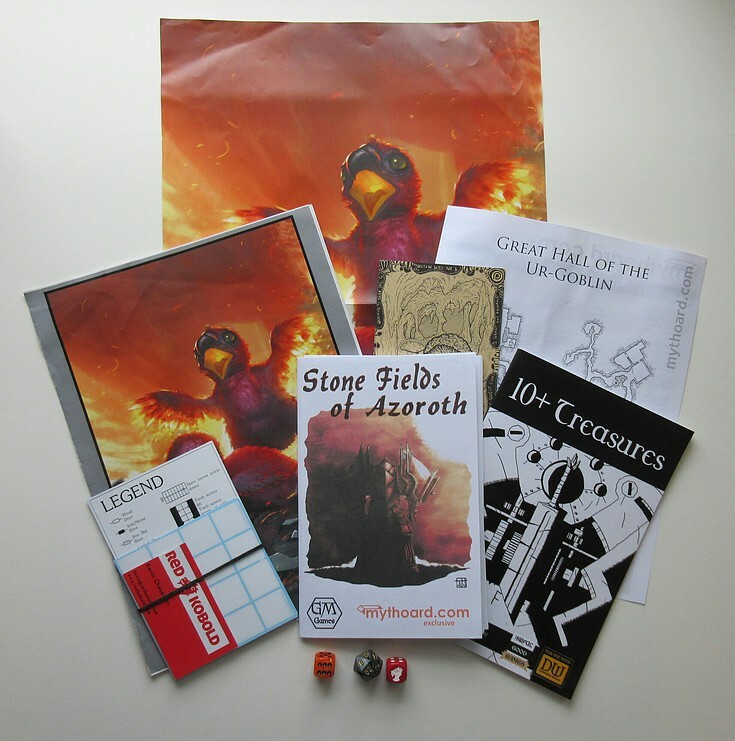 Many different types of tabletop RPG gaming products have made an appearance in Mythoard boxes including adventure modules, rule books, magazines, maps, miniatures, terrain, dice, decks of cards, tokens, magnets, stickers, game props, dice bags, and other gaming accessories. The Beta Mythoard Box Contents. 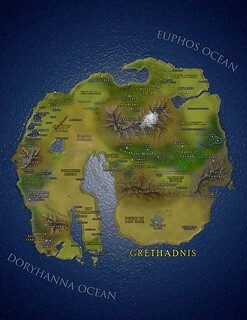 Gaming companies who have had products featured in Mythoard boxes include: 6d6 RPG, AAW Games, Advanced Deployment, Adventureaweek.com, Aengium, Antherwyck, ArcKnight, Awful Good Games, Bad Mike's Books & Games, Barrel Rider Games, Brabblemark, Chessex, Chubby Monster Games, Crooked Staff Publishing, Dark Naga Adventures, D-oom Products, Dyson Logos, Engine Publishing, Expeditious Retreat Press, Fabled Environments, Flatland Games, Forever People, Game Mash, Genius Loci Games, GM Games, Goodman Games, Gygax Magazine, Heroic Maps, Imaginary Maps, Inkwell Ideas, Kaplow Games, Lesser Gnome, Mentats of Gaming, Metal Weave Games, MonkeyBlood Design, Moon Dice, Oubliette, Owl Knight Publishing, Plagmada, Playground Adventures, Precis Intermedia, Raging Swan Press, Random Encounters, Rarr! 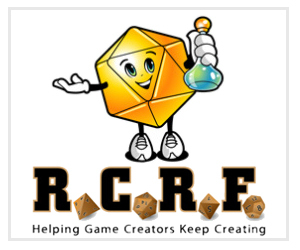 I'm a Monster Publishing, Red Kobold, Roan Studio, Rogue Games, Shoreless Skies Publishing, Silver Crescent Publishing, Simian Cricle Games, Squarehex, Stormlord, Tabletop Gaming Center, The Undercroft, Throwi Games, Ultanya Publishing, Winter Eternal, Womat's Workshop, and many others. I have been a subscriber to Mythoard since its public release, and have ordered every box offered since December of 2014. Although I do try out other related subscription box services, I always keep my Mythoard subscription active every month. In fact, as I was writing this article, I received the shipping and tracking information for the latest Mythoard box! I'm quite excited that it's on the way. 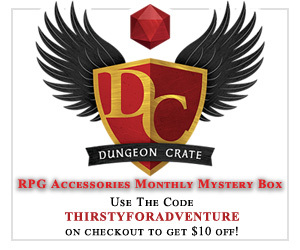 Since the inception of Mythoard there have been several other gaming-related subscription services that have been introduced such as Dungeon Crate ($35.95/month), Battle Bin ($30 + shipping/month), and Game Box Monthly ($30.50/month). These competitors are worth mentioning in their own right, and offer great services as well. In addition to being one of the least expensive tabletop RPG subscription box services, it’s my opinion that Mythoard also offers the greatest return on investment month-after-month. 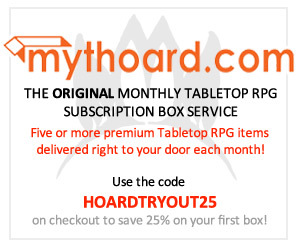 Not only is Myhoard the original tabletop RPG subscription box service, but it remains one of the most affordable, and rewarding. 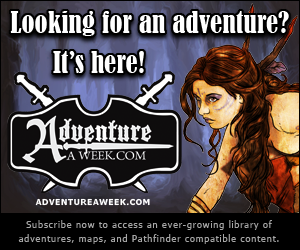 The content theme varies greatly to encompass a wide range of gaming genre from high fantasy, to science fiction, to post-apocalyptic, to horror, and even the abstract. Across the board, Mythoard offers a pleasing balance between books, accessories, and digital content. 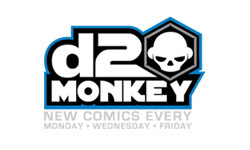 While box contents vary each month, a subscriber can expect to get products ranging from game books, magazines and adventures to dice, miniatures, and cards. 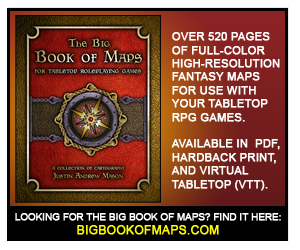 Some of the content, particularly RPG books or magazines, can be a bit obscure or dated. For example, several boxes have included content originally published by The Judge’s Guild in the 1980’s or earlier. In a recent Mythoard box one of the books provided was published the month I was born (36 years ago). It is important to note that Mythoard subscriptions do also include new and recently published products as well as new and exclusive content. I don’t personally find these older products to be a negative, as I quite enjoy receiving these collectable items which are always in great condition and sealed in plastic sleeves. I find the classic content intriguing and inspiring. However, if a customer subscribes to the service expecting only the newest titles being published to appear in every Mythoard box, they may be disappointed by these items. In conclusion, based on affordability, variety and quality of content, and proven track record, I rate Mythoard as a 5 / 5 Bling! service. 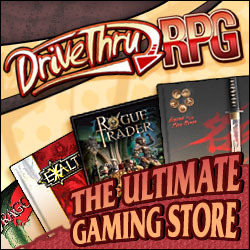 My subscription has added many great products to my personal tabletop RPG gaming collection, and I wholeheartedly endorse a subscription to any fellow gamer. I you were considering subscribing to a subscription box service, and intend to limit your selection to one service, then Mythoard would be my suggestion. Transparency Disclaimer: I have always and continue to personally pay for my subscription to the Mythoard subscription box service, and I do not receive compensation of any kind for this review or any other endorsement I have made for Mythoard. I do not receive any sort of affiliate compensation for use of the links herein or from the provided new subscriber discount code. 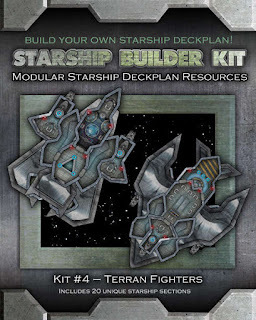 While I am not a professional associate of Mythoard, as a freelance game designer, I work for many game companies and as a result some products that I have worked on have appeared in Mythoard boxes (as well as in boxes from other tabletop RPG subscription services). The Mythoard website and social media accounts sometimes utilize my personal photographs of monthly Mythoard box contents with my full, royalty-free permission.